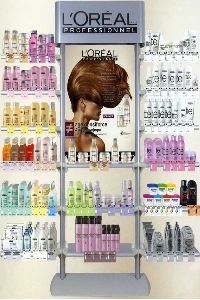 Brand L’oreal rightfully holds the leading position in the segment of the mass market for many decades in a row. Cosmetics L’oreal has a deserved reputation, high quality and millions of fans worldwide who eagerly await the release of new collections, new shades to change their images. Real life in the style of L’oreal – such a fate would be the envy of the owners of many brands, not less famous and respectable. In 2007, the French brand celebrated its 100th anniversary. A century it offers women become beautiful and desirable, «for they are worthy.» Many years L’oreal does not change its recognizable advertising slogan, and during that time the number of fans of the brand philosophy only increased. Its slogan is not just a beautiful phrase, which forces women to buy beauty products, even those who do not need them. The L’oreal different approach – one that makes the believing women that irresistible to any of them, regardless of skin color and hair, nationality and race. On the idea of beauty, for all built a multibillion-dollar industry company, which each year confirms its effectiveness. History of the brand L’oreal began in 1907 when the cosmetic industry is only beginning to get up on your feet, making timid attempts to offer the women what they have not seen before. Company founder, Eugene Schuller, was a chemist who worked at the pharmacy, while experimenting with solutions. He developed the first in the history of hair dye, which allows not just to bleach my hair that women made up to invention. His paint disclose the scales, allowing to penetrate into hair coloring pigments. Hairdresser, who took the Sharper the paint on trial, was surprised and delighted. Thus began the history of the latest hair dyes and history of the company, which originally had the name L Aureale. The name L’oreal appeared in 1939. Over the past years, a brand that produces the hair dye, L’oreal has turned into a huge concern that combines many different brands, producing cosmetic tool skin care and hair care products, color cosmetics, as well as professional products for hair. Cosmetics L’oreal, for skin care meant for men (series Men Expert), for women, the young and the Mature age. For young skin, which needs to be moistened and elimination of imperfections, presents a series of Pure Zone. Anti-aging care from L’oreal gives cosmetics series «Code of youth», «Ревиталифт», «Derma Genesis», «Trio Asset.» The brand has its own sun gamma Sublime (Sublime Sun and Sublime Bronze). Women appreciate decorative cosmetics L’oreal, the brand of which is constantly replenished with new tools and flowers. Among the most famous are: toners Alliance Perfect, Foundation, eye shadow and blush Infaillible, Mat Magique, Lumi Magique, ink Architect, Telescopic, Volumissime. The widest range of shades presents in grades lipstick and nail Polish Color Riche, Glam Shine, Rouge Caresse, Shine Caresse. Many years in a row L’oreal remains a favorite brand, helping women to paint hair at home, receiving the result, comparable in salon-tanning. In its assortment marked with quality paint Excellence, Préférence, and new Casting Creme Gloss, Sublime Mousse and Préférence Ombres. Hair care from L’oreal is feasible through the broad adapted for different hair types range of Elsève, and for professional use, there is no less an extensive series of L’oreal Professionnel for women and men. Professional series will be effective styling – gamma L’oreal’s Studio. Cosmetics L’oreal is in great demand thanks to the skillful ad campaigns, brand, who has resorted to the help of their «messengers of beauty», famous women and men, who are representatives of a certain type of appearance. Every year the brand chooses new faces, many of whom work for already many years. Including Claudia Schiffer, Andy McDowell, Charlize Theron, Laetitia Casta, Mila Jovovich. Also on the advertising posters can be seen eve Лонгорию, Даутцен Crlei, Jennifer Lopez, Aishwarya Rai, Penelope Cruz, Nastassja Kinski, Beyonce Knowles and other world famous beauties. The participation of these Actresses, singers and models allows normal women recognize yourself when choosing one or the other, lipstick or hair dye nail Polish cream or wrinkle. This gives them self-confidence and feeling of complicity in a beautiful life. Because they really deserve it.